The Bridges to Contemplative Living with Thomas Merton series enjoys widespread popularity among parish-based small groups, religious communities, and contemplative retreat centres. The series has also been warmly accepted among members of ecumenical traditions. Lent and Holy Week opens the writings of Thomas Merton in easily digestible pieces and eloquently pairs them with the words of other great spiritual thinkers. Designed for use in new or existing small groups between Ash Wednesday and Easter, this booklet offers readers an accessible introduction to contemplative dialogue and is built around eight compelling Lenten themes, including living more deeply in Christ, forgiveness, humility and prayer. The Merton Institute for Contemplative Living is dedicated to personal spiritual transformation through raising awareness of Mertons spiritual insights. Its purpose is to promote his vision for a just and peaceful world. Robert Toth has served as the executive director for the Merton Institute for Contemplative Living since 1998. Jonathan Montaldo is resident director of Bethany Spring, the Merton Institute Retreat Centre. Bridges to Contemplative Living with Thomas Merton by Robert G Toth; Jonathan Montaldo was published by Ave Maria Press in January 2009 and is our 26228th best seller. The ISBN for Bridges to Contemplative Living with Thomas Merton is 9781594712043. 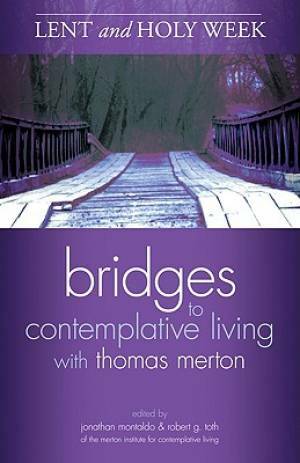 Be the first to review Bridges to Contemplative Living with Thomas Merton! Got a question? No problem! Just click here to ask us about Bridges to Contemplative Living with Thomas Merton.